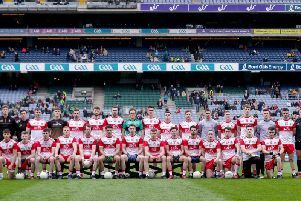 County secretary Danny Scullion has warned changes to the GAA club calendar brought forward at Congress earlier this year makes a restructuring of the current Derry All County League set-up inevitable. “The changes brought forward at Congress earlier this year, i.e. the introduction of a round robin (super 8s) phase of the All-Ireland Senior Football Championship, the bringing forward of the All-Ireland finals in hurling and football, a condensed Christy Ring series and the introduction of the summer-based U20 football championship will combine in 2018 in a way that means changes to our current league structures are inevitable. “We no longer have the required number of weekends during the months April to July to complete, for example, a 16-team senior league,” explained Scullion. “Weekends freed up post-August are of no benefit to counties who wish to see county players take part in a majority of league games, hold a knock-out championship and also finish leagues prior to the championships beginning. “These three elements were key findings of our games review committee which surveyed all our clubs in detail in 2015. If we wish to preserve these three outcomes, then changes to our current league structures will have to be made,” he added.